The word onigiri, meaning rice ball, comes from nigiru (握る にぎる), a verb meaning to grasp, squeeze, or grip. In the Heian period (794-1192), onigiri were associated with warriors, who packed them as food when in battle or on the move. Also called omusubi, (おむすび from musubu 結ぶ むすぶ, a verb meaning to bind or pack) and nigirimeshi (握り飯 にぎりめし, meshi 飯 めし means rice). To make onigiri, an umeboshi (梅干 うめぼし pickled plum), a clump of salted salmon flakes, katsuobushi (かつお節 かつおぶし dried bonito) flavored with soy sauce, or other filling is tucked into a handful of freshly cooked rice. Using the palms of the hands rubbed liberally with salt, the ball of rice is packed around the filling in a cylindrical, round, triangular or ball shape. The ball may be wrapped in nori (海苔 のり dried laver seaweed) or covered with sesame seeds. Onigiri are easy to carry and keep well. Japanese rice is sticky, so it can readily be formed into balls, and the salt applied in packing the rice acts as a preservative. Umeboshi (梅干 うめぼし pickled plum), a favorite filling, has anti-bacterial qualities that inhibit spoilage. 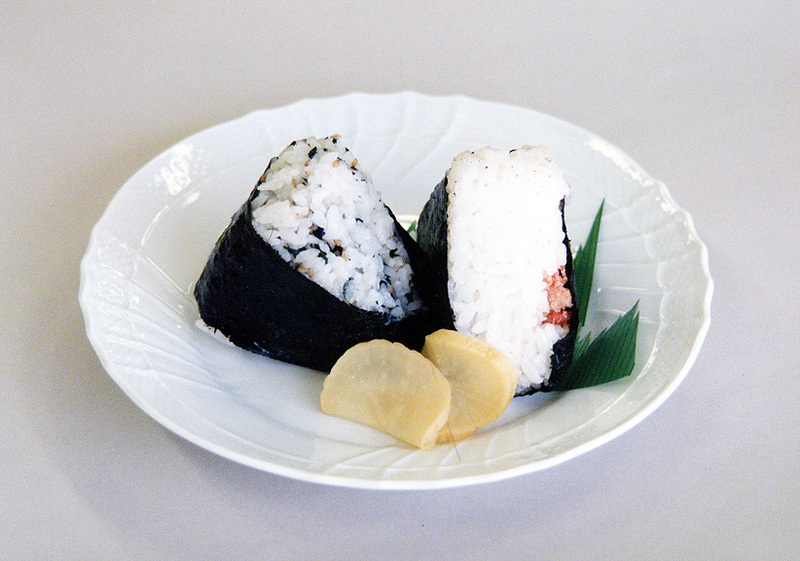 Some newly invented varieties of onigiri, such as those made with canned tuna and mayonnaise, have become very popular.